The State Hermitage Museum (Russian: Государственный Эрмитаж, Gosudarstvennyj Èrmitaž) in Saint Petersburg, Russia is one of the largest museums in the world, with three million works of art (not all on display at once), and one of the oldest art galleries and museums of human history and culture in the world. 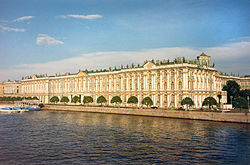 The vast Hermitage collections are displayed in six buildings, the main one being the Winter Palace which used to be the official residence of the Russian Tsars. International branches of The Hermitage Museum are located in Amsterdam, London, and Las Vegas. Catherine the Great started the famed collection in 1764 by purchasing more than 225 paintings from Johann Ernst Gotzkowsky, after bankruptcy in the year before. Gotzkowsky provided 225 paintings to the Russian crown, to be able satisfy to his obligations. Flemish and Dutch masters such as Dirck van Baburen, Hendrick van Balen, Rembrandt, Rubens, Jacob Jordaens, Antoon van Dyck, Hendrick Goltzius, Frans Hals, Jan Steen and Gerrit van Honthorst formed the basis and the beginning of the collection in the Hermitage. Russian ambassadors in foreign capitals were commissioned to acquire the best collections offered for sale: Brühl's collection in Saxony, Crozat's in France, and the Walpole gallery in England. Catherine called her art gallery my hermitage, as very few people were allowed within to see its riches. In one of her letters she lamented that "only the mice and I can admire all this." She also gave the name of the Hermitage to her private theatre, built nearby between 1783 and 1787. The New Hermitage was built specially to house art collections. Gradually imperial collections were enriched by relics of Greek and Scythian culture, unearthed during excavations on Pereshchepina, Pazyryk, and other ancient burial mounds in southern Russia. Thus started one of the world's richest collections of ancient gold, which now includes a substantial part of Troy's treasures unearthed by Heinrich Schliemann and seized from Berlin museums by the Red Army at the conclusion of World War II in 1945. A portrait gallery of the 1812 War heroes. 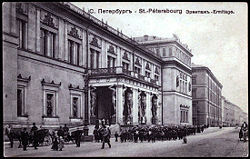 The imperial Hermitage was proclaimed property of the Soviet state after the Revolution of 1917. The range of its exhibits was further expanded when private art collections from several palaces of the Russian Tsars and numerous private mansions were being nationalized and then redistributed among major Soviet state museums. Particularly notable was the influx of old masters from the Catherine Palace, the Alexander Palace, the Stroganov palace and the Yusupov Palace as well as from other palaces of St. Petersburg and its suburbs. Later the Hermitage received modern art from private collections of Sergei Shchukin and Ivan Morozov which were nationalized by the Soviet state. New acquisitions included most of Gauguin's later oeuvre, 40 works of Cubist works by Picasso, and such icons of modern art as Matisse's La danse and Vincent van Gogh's Night Cafe. After World War II the Hermitage received about 40 canvasses by Henri Matisse as a gift from the artist to the museum. 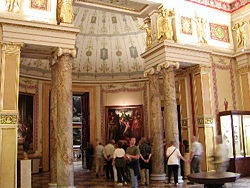 Other internationally known artists also gave their works to the Hermitage. The hard-liners in the Soviet government did not pay much attention to maintenance of art, which was officially labeled as "bourgeois" and "decadent" art. During the 1920s and 1930s, under the rule of Stalin, the Soviet government ordered the sale of over two thousand works of art, including some of the most precious works from the Hermitage collection. These included priceless masterpieces like Raphael's Alba Madonna, Titian's Venus with a Mirror, Botticelli's Adoration of the Magi, and Jan van Eyck's Annunciation among other world known masterpieces by Rembrandt and Van Dyck, among others. In 1931, after a series of negotiations, 22 works of art from the Hermitage were acquired by Andrew W. Mellon, who later donated most of these works to form a nucleus of the National Gallery of Art in Washington, D.C. There were other losses, though works of their kind are more abundant: thousands of works were moved from the Hermitage collection to the Pushkin Museum in Moscow and other museums across the USSR. 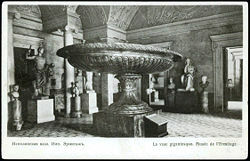 Some pieces of the old collection were also lost to enemy looting and shelling during the Siege of Leningrad in the Second World War, when the Hermitage building was marked as one of the prime targets of the Nazi air-raids and artillery, although it was more or less successfully defended by the surviving citizens of Leningrad. One of the halls in the Hermitage Museum. After the war the government attempted to compensate for its recent losses by transferring to the museum some of the art captured by the Red Army in Germany. The most highly-priced part of the booty were 74 Impressionist and Post-Impressionist paintings taken from private collections of German business elite. These paintings were considered lost until 1995 when the museum unveiled them to the public as "Hidden treasures." The Russian government maintains that these works provide just a small compensation for irreparable losses inflicted on Russian cultural heritage by the German invasion in WWII, including the almost complete destruction and looting of the Tsar's palaces in Peterhof, Oranienbaum, Pavlovsk, Gatchina, and Tsarskoe Selo, as well as other cities and towns under Nazi occupation. Moreover, the State Duma (legislature) passed a law forbidding the return of disputed works to their owners on the grounds they were guilty of financing the Nazi regime. In recent years, the Hermitage expanded to the nearby buildings of the General Staff and launched several ambitious projects abroad, including the Guggenheim Hermitage Museum in Las Vegas, the Hermitage Rooms in London's Somerset House, and the Hermitage Amsterdam in the former Amstelhof, Amsterdam. In July 2006, the museum announced that 221 minor items, including jewelry, Orthodox icons, silverware and richly enameled objects, had been stolen. The value of the stolen items was estimated to be approximately $543,000. By the end of the year 2006 some of the stolen items were recovered. The Hermitage complex as seen from across the Neva River. The New Hermitage and Hermitage Theatre are on the left; the Winter Palace is to the right. Among the highlights of the Hermitage collection of Western art include Michelangelo, Leonardo da Vinci, Rubens, van Dyck, Rembrandt, Poussin, Claude Lorrain, Watteau, Tiepolo, Canaletto, Canova, Rodin, Monet, Pissarro, Renoir, Cézanne, van Gogh, Gauguin, Picasso, and Matisse. There are several more collections, however, including the Russian imperial regalia, an assortment of Fabergé jewelery, and the largest existing collection of ancient gold from Eastern Europe and Western Asia. ↑ According to The Guinness book of world records. ↑ Hermitage recovers another piece of stolen art Retrieved December 10, 2007. This page was last modified on 22 December 2017, at 20:10.